We initially had instructor slides combined with exercises in the beginning of class. Towards the end we had less slides and more practical exercises to go through in class. 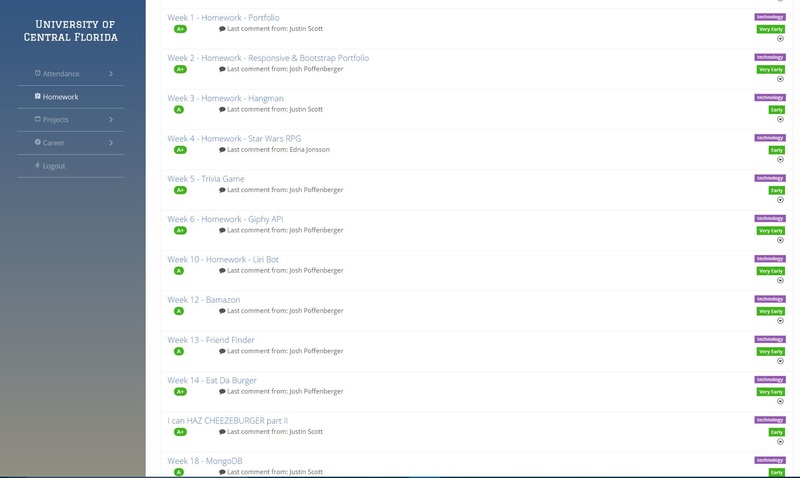 Homework was assigned each week and we had 1 week to complete it. Each homework assignment was like a mini project related to the topic we covered that week. They helped to give us useful mini projects in our GitHub online repository. They were graded and we got feedback on what we did. After the due date, solutions, would be posted online so we could review and rework on our own. Happy to say my lowest grade in the class homework was a A- which shows that I’m no slouch when it comes to learning code and I didn’t just scrape by in the class. We had 3 class projects. The first two I did as part of a team and my final project I chose to do solo to be able to showcase my skills fully. I’ll do a separate post about my final project later. They had Teaching Assistants who were always happy to help. I didn’t get to take full advantage of the help because I’d usually be trying to leave right after class to commute back home. They also had a few people who are in the industry stop by and give talks. We had 1 company tour of PowerDMS in Orlando. Also they provided career guidance in getting our resumes and our LinkedIn profiles ready. It’s really good that their career services continue after graduation to try to help us find jobs. Unfortunately they did not cover WordPress which is what this website uses. I still want to learn how to customize and build WordPress themes so I can improve sunitagirl.com Based on all the stuff I learned in coding bootcamp it shouldn’t be too hard to learn that. It was all worth it though because I was able to graduate in April from UCF’s Coding Bootcamp 🙂 and better prepare myself for a new career as a Web Developer. I learned a ton and I feel more confident developing software for web applications. Hi! Would love an update as Im looking at this program as well. I definitely learned a lot. Wasn’t able to get a job specifically in Web Design but I do use some of the coding concepts occasionally at work now. Did this help your job search? I’m considering this and enjoyed your post. thanks in advanced! It did somewhat. I got mostly calls in Orlando. If you live in that area you should be able to find something. I live out on the Space Coast so it’s difficult to find tech jobs that don’t require citizenship.